OER and Inclusiveness: Are Expectations Fulfilled? (This blogpost is a co-production with Ben Janssen. A Dutch version of this post was published on SURFspace). Sustainable Development Goal 4 of UNESCO reads “Ensure inclusive and equitable quality education and promote lifelong learning opportunities for all”. Open Educational Resources (OER) have the potential to contribute to this objective. But to what extent is this potential already being realised? 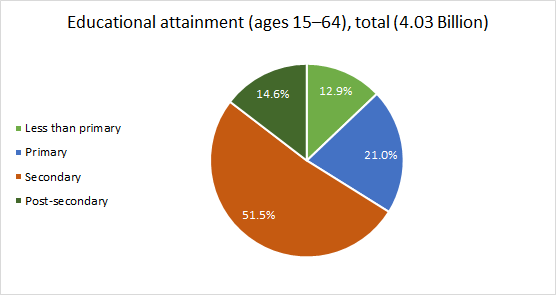 In the figure below, areas encompassed by dotted lines are normally considered as TVET (Orr, 2017). 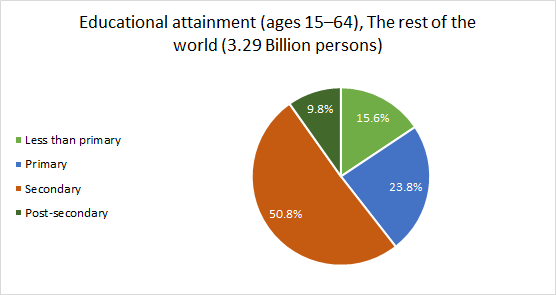 The Development Report 2018 of the Worldbank (2018) provides data about educational attainment of the world population in the age of 15-64 year. This allows TVET to be placed in a broader context. The next three figures illustrate the data. 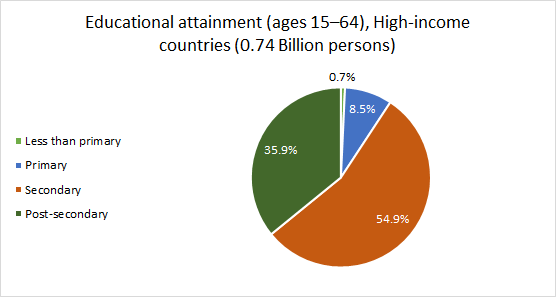 From these graphs it can be concluded that of the people in the countries that are not considered to be “High Income” countries (“the rest of the world”), 90.2% does not have higher education. That is why education policy in many of these countries should focus mainly on TVET (upper secondary level). In the research we found that stakeholders in the TVET sector attribute many opportunities to OER for improving the quality of education in TVET. However, these opinions contrast sharply with actual activities to increase the adoption of OER in TVET. The research also taught us that there are hardly any research reports and articles about adoption of OER in the TVET sector available in open access formats. We focused on English publications. To illustrate: the OER Knowledge Cloud database, which may be qualified as the source for international literature on OER available under open access, does not contain articles about TVET and OER, with the exception of studies into OER in Community Colleges in the USA. At a global level, the picture is that most efforts for adoption of OER (both in terms of research and implementation) focus on higher education. However, these efforts address only 14.6% of the world’s population. We may assume that OER may make even more difference to achieve lower access barriers to quality education in the “rest of the world” than in the “High Income” countries. But only 9.8% of people are reached in those parts of the world when focusing on higher education. 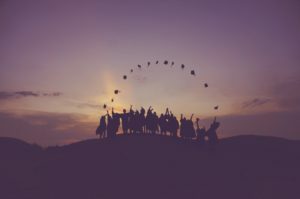 The Commonwealth of Learning is one of the few organizations that focus on the adoption of OER outside of higher education in that part of the world. The theme of the 2nd OER World Congress in Ljubljana in September 2017 was “OER for Inclusive and Equitable Quality Education: From Commitment to Action“. However, if this “Action” does not focus much more than previously on sectors other than higher education, with a focus on the “rest of the world”, there is a real danger that OER will contribute to increasing the gap between the “Haves” and “Have-nots” instead of bridging this gap. And that is not the intention of the open world: reducing inclusive access to quality education instead of increasing it! Posted in Open Educational Resources and tagged SDG 4, UNESCO.